According to a news feature from RingTV.com, top-ranked welterweights Shawn Porter and Danny Garcia, former world champions both, have agreed terms and are set to fight at the Barclays Centre in New York on August 25. The winner will walk away with the WBC 147 pound crown the still-injured Keith Thurman vacated. Thurman is guaranteed an immediate shot at the winner upon his return to action. And what an intriguing battle this one promises to be. Porter, an all-action warrior, says he has “multiple ways that he can win,” while Garcia, equally as experienced and arguably a better boxer, is sure that victory will be his in the summer. But who does wins, and how? 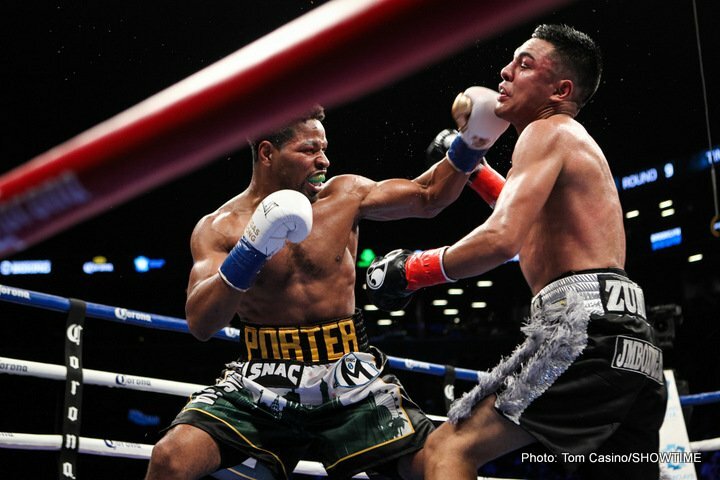 Porter, 28-2-1(17) was the co-star in a Fight of The Year candidate when he went to war with Thurman back in the summer of 2016, losing a unanimous decision that in truth could have gone either way. The action was so special, fans called for a second slice almost immediately. We are still waiting for that rematch, but with a fully healed Thurman poised to challenge the Porter-Garcia winner in an effort to regain his belt, maybe we could see Thurman-Porter II before too long. Garcia of course will disagree, and a shot at revenge over Thurman is certain to drive him on. “Swift,” last seen pulling out a stunning KO win over a game but faded Brandon Rios, lost a far less thrilling 12-rounder with Thurman, Garcia overcoming a torrid first quarter to hang in there to the final bell. Surprisingly to many, the result was a split decision and Garcia, 34-1(20) instantly cried robbery and called for a return go at Thurman. Now, in August, Garcia and Porter will rumble and Porter-Garcia is a tough one to pick. Garcia has never shone as a 147 pound fighter the way he did down at 140, yet he is one tough dude. A tough dude with skills and a great deal of experience. But Garcia has been lazy in some of his fights – some of his fights as a welterweight. In this regard, Porter is a polar opposite. Possessing a quite ridiculous engine, and with it an amazing ability to keep the work output going for all 36-minutes, Porter is one of the most consistently exciting fighters out there today. Does Porter, who, like Garcia, has a great chin, out-work his man in this fight; does “Showtime” show that he wants it more than Garcia? Then again, both men carry good power; the edge perhaps going to Garcia; his left hook of course being a formidable weapon. We know what Porter is about, and his let’s-go-to-war and battle it out approach doesn’t look like changing in this fight; or in any fight come to that. Garcia, more polished, may have to work harder than he has done in some time if he’s to pick up more points than Porter. And, a quite surprising KO aside, this fight does have the look of a distance fight; a potentially thrilling distance fight at that. We have quite a summer schedule already and this fight will likely prove to be a summer sizzler to remember.